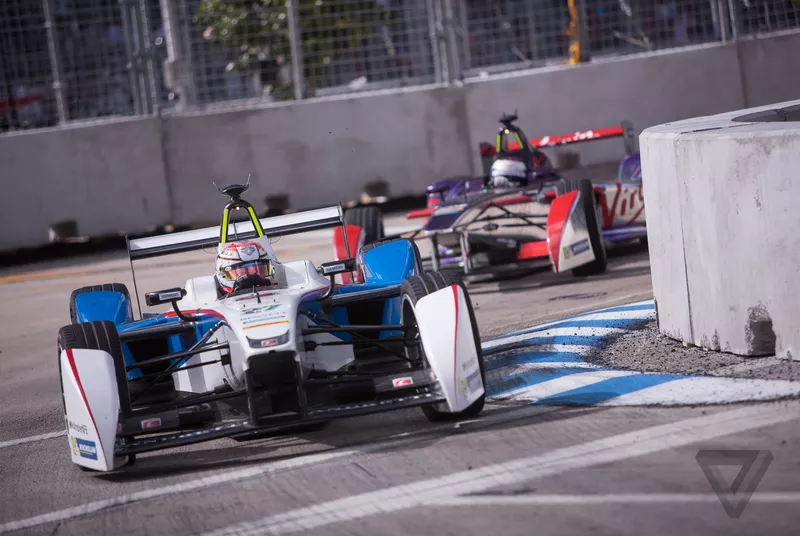 It seems hard to believe, but we're already staring down the barrel at the second season of Formula E. The all-electric series made its thrilling debut just over a year ago, and what followed was 10 more races of extremely competitive racing. The first race of the second season takes place tomorrow in Beijing at 4AM ET. Fans around the world will have a number of options for watching. The race will be broadcast on Fox Sports 1 in the US, Fox Sports Racing in Canada, and ITV 4 in the UK. (You can check for coverage in your country here.) The main broadcast will also be live-streamed in more than 50 countries alongside onboard views on the Formula E website. This year, a number of changes have been made — to the cars, to the drivers, and to the way the series works — that could make things even more exciting. So here's what to expect as we head into the the second season of Formula E.
Every car in the first season of Formula E was basically the exact same, save for the paint and the driver. The point was to keep the series focused on developing the battery tech while making sure everything worked in the first place. In turn, the competition was extremely close throughout the season. But from well before day one, CEO Alejandro Agag has promised that the teams would, over time, be able to independently develop more and more of the car on their own, just like in other major racing series. Leading up to season two, the teams were allowed to develop their own drivetrains. That means the electric motor, the gearbox / transmission, and the rear suspension (or "everything that is behind the battery," as driver Lucas di Grassi puts it). Eight of the 10 teams did just that — two are running the same spec package from season one — and the most notable changes are to the gearboxes. Some teams took just one or two gears off of last year's five-gear transmission. Other teams will run with just one, removing the need to shift at all. Decreasing the number of gears will give cars more torque, and drivers will spend less time spent shifting, which disrupts a driver's momentum as well as the car's regenerative braking process, where energy from the brakes gets turned into extra power for the battery. Many of these changes were made in conjunction with outside manufacturers, too. The Virgin team, for example, contracted Citroën DS to build its new electric motor. What will this do to the competition? Right now it's unclear. Some teams might be faster on one track, but wind up slower on others. The two teams that haven't made any changes may have an advantage early on, but might be left in the dust by season's end. And, in addition, the maximum power of every car's battery has been increased by 30 percent, too, from 150kW (about 202 hp) to 170kW (227 hp) for season two. The most-maligned feature of Formula E so far has probably been Fanboost, a voting contest held before each race that awarded three drivers temporary boosts of power to use at their disposal. Instead of giving into the criticism, though, the series has expanded and radically changed how Fanboost works in season two. Fans can now vote for drivers on the Formula E website, from the Formula E app, or by using specific hashtags on Facebook, Twitter, and Instagram. (Last season, voting was only allowed on the website and the app.) What's more, they can now do this during the race, as voting ends six minutes after each green flag waves. To accommodate that, the way that winning drivers can use Fanboost has changed in a couple of ways. Since voting is allowed during part of the actual race, winning drivers won't be able to use their boost until they switch into their second car for the last half of the race. But more importantly, the drivers no longer get two temporary power boosts. Instead, they're awarded an allowance, and they can use it however they see fit; for example, you could use it all at once to push the motor to its maximum power output, or you could use it more judiciously, giving your car a small power boost that will last longer. It's an important change because, as much as it was mocked, Fanboost was mostly inconsequential in the first season. Many drivers used the boost to do things like make a pass on a straightaway only to find themselves speeding too hard into a corner, rendering the boost ineffectual. Making Fanboost less of a one-shot deal introduces new layers of strategy, and in theory should make it more important to win. While Formula E hardly had any household names competing in the inaugural season, it's not like the drivers were complete nobodies. A huge portion of the team owners and competitors come from highly regarded racing lineages. There's Nico Prost, son of F1 legend Alain Prost — who also happens to be a co-founder of Nico's team, and who coaches Nico through every race. Driver Bruno Senna is the nephew of Ayrton Senna, another F1 legend. And Michael Andretti, son of Mario Andretti and a one-time IndyCar champion, owns and operates a team. Most, if not all, of these big names are back this season. But one particular addition could bring more eyes to the series: 44-year-old Jacques Villeneuve. He's a former F1 champion, CART Champion, and Indy 500 winner, and he's tried his hand at just about everything else. He brings maybe the most impressive résumé to the series, but he also brings a fierce personality. Many of the other drivers are upstarts looking to make a name and establish a reputation, but Villeneuve already has both. A few drivers from season one have departed: Jarno Trulli is now managing his team full time instead of racing, Virgin driver Jaime Alguersuari left the series and has been replaced by former Andretti driver Jean-Eric Vergne, and Nick Heidfeld has moved from Venturi racing to Mahindra (replacing Karun Chandhok), just to name a few. Part of the fun in the first season was that there was a bit of a revolving door of drivers in the bottom half of the field, which meant that every week someone new had something to prove. Most drivers are juggling the (mostly) monthly Formula E duties with part- or full-time commitments to other series, but that never hurt the competition, and it likely won't this season.